Richmond BizSense – March 22, 2016 The top eight local firms in Richmond BizSense’s annual list of the highest-producing homebuilders retained their same spots from the previous year, while Cornerstone Homes came in at No. 12, in its first appearance in the annual rankings. 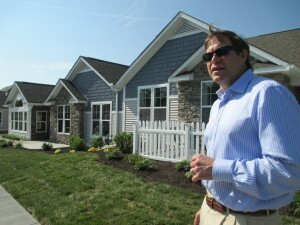 Owner Roger Glover, who focuses on communities for residents 55 and up, sold his first homes locally in 2015 after building in other markets over the past few decades. “We made a decision to focus on Richmond, and up to Fredericksburg and Hampton Roads, starting two years ago,” Glover said. “We weren’t building at all in Richmond until 2014.” That was when Cornerstone purchased Magnolia Lakes, its first local property, out of foreclosure. Glover said he had kept a distance from Richmond previously because Magnolia Lakes’ original developer, Tascon Group, had the rights to the metro Richmond market for Epcon Communities, a national homebuilder that Cornerstone works with on its projects. Read More from Richmond BizSense.